There was a lot of talk ahead of the ODI series about the scoreline that India would w n against Australia and its time for some experimentation before the World Cup. There was absolutely no talk about the struggling Australian side, leave alone the visitors winning the 5-match ODI series. Just like in life, scripts can sometimes go awry and in a matter of a week’s time, both Australia and India find themselves on the opposite side of the spectrum. This clearly shows that one week is a lot of time in international cricket. Virat Kohli’s men looked a proper World Cup 2019 favourite after winning the first two ODIs, whereas one felt 2019 was going to be equally tough for Australia as it was last year. 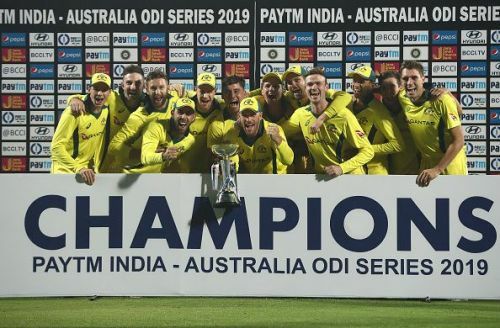 To win a series in India is itself a huge task for any visiting team, but to win a 5-match series after being 2-0 down is something very special that Australia has achieved. Let us also remember that this is not a full-strength Australian side with few star players missing due to ban and injuries. If you add David Warner, Steve Smith, Mitchell Starc and Josh Hazlewood to this side, Australia once again become a strong side and one cannot take them lightly especially in World Cups where they tend to raise their game. Winning the World Cup 5 times is a testimony to a great sporting nation. As far as India are concerned, there were quite a few questions ahead of the series, mainly the No. 4 batting slot, the all-rounder's place in case Hardik Pandya isn't fully fit and doubts over the best team combination. With World Cup in mind, India did try to juggle a few things around but in the process have lost a rare ODI series at home and for the first time under the leadership of Virat Kohli. Let’s go through the key takeaways from the 5-match ODI series.